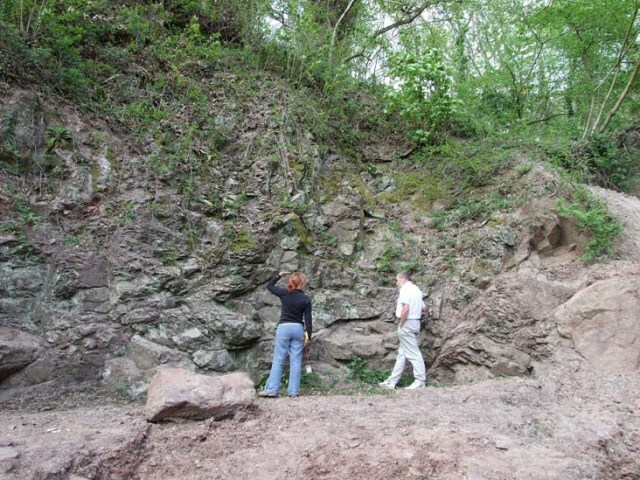 The Huntley Quarry Geology Reserve was officially opened in 2007, and is the first geology reserve in Gloucestershire. 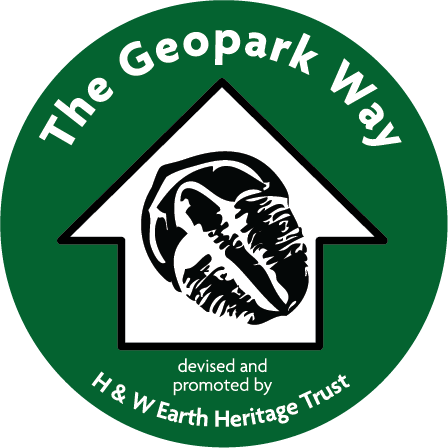 The reserve, and its surrounding woodland, cover an area of 0.87 hectares and is owned and managed by Gloucestershire Geology Trust. 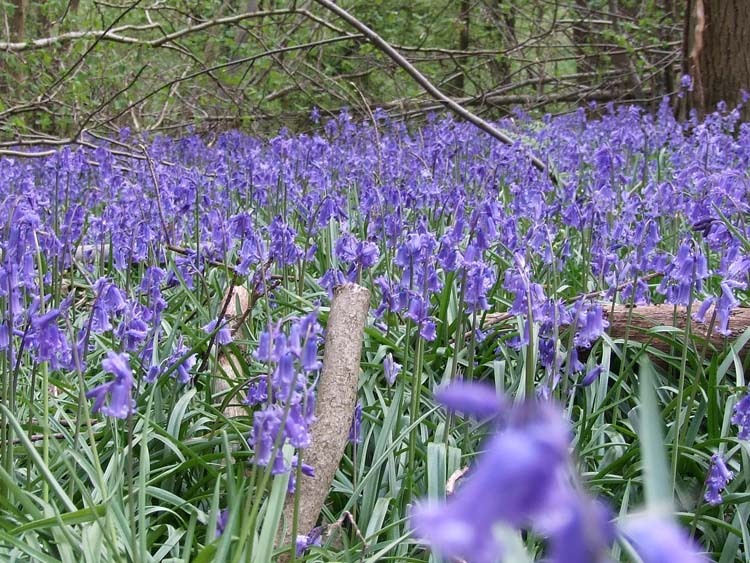 Three quarries, as well as the bluebell and daffodil woodland can be visited at the reserve. 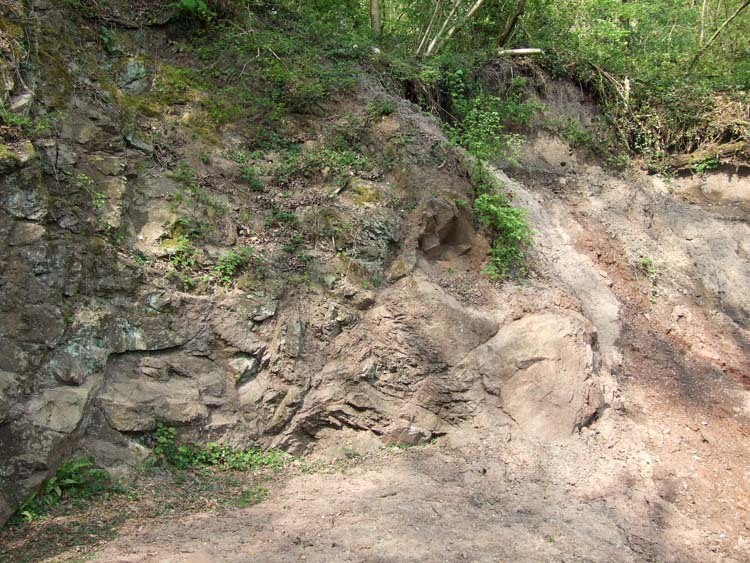 Acker’s Quarry is a small site which exposes Triassic Bromsgrove Sandstone sediments, some 237 – 228 million years old. 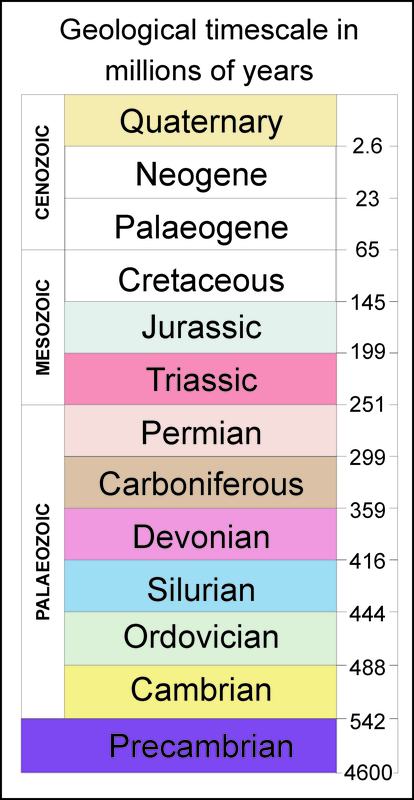 These sediments were probably deposited in a river or estuary that flowed across the deserts of the supercontinent Pangaea. Bright’s Hill Quarry can be found to the back of Huntley Quarry. Exposed here are Early Silurian (Huntley Hill Formation) siltstones and sandstones, dating from 436 – 428 million years ago. 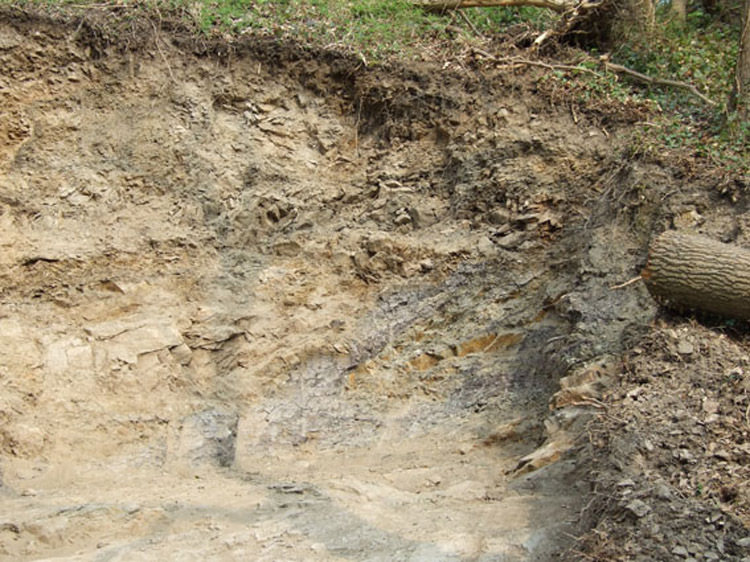 These sediments were probably deposited in a shallow marine environment, which bordered a landmass called the Midlands Platform. Huntley Quarry is the main quarry within the reserve and is a ‘geological gem’. Listed below are just a few of the reasons why this quarry is geologically very important. The only known exposure of the Huntley Quarry Beds. These have recently been dated to Late Ordovician to Early Silurian, 445 – 439 million years ago. The sandstones and siltstones that make up the Huntley Quarry Beds contain volcanic material, lava and ash fall deposits. These are volcaniclastic sediments. The Blaisdon Fault, part of the East Malvern Fault Complex, is very well displayed within the quarry. The Huntley Quarry Beds appear to lie near horizontal near the A40, becoming obviously overturned in the main quarry. The Huntley Quarry Beds appear to form the core of the May Hill Dome. Evidence suggests that some of the folding of the Huntley Quarry Beds seen within the quarry is due to the folding of sediments to form the dome and that subsequent faulting moved along these folded beds as planes of weakness. The Blaisdon Fault has moved in different directions over the course of its long history, displaying several phases of global tectonic plate movements from the closure of the Iapetus Ocean, the formation of the supercontinent ‘Pangaea’, and the subsequet pulling apart of that landmass. These movements can be seen to affect the bedding and sediments, as well as the overall structure of the rocks. There are a number of associated smaller thrust faults seen within the main face, and on the newly exposed ramp section, where the core of a tight fold is also evident. 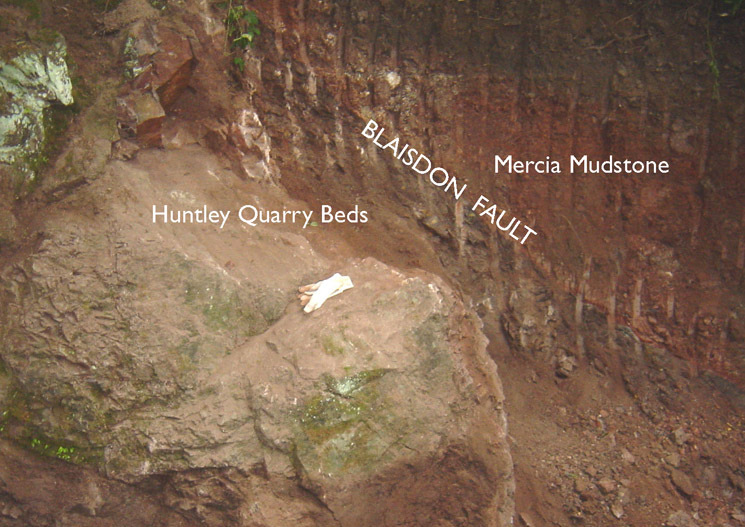 The younger rocks of the Mercia Mudstone Group and Bromsgrove Sandstone rest up against the Huntley Quarry Beds along the Blaisdon Fault, brought down by rifting of the Worcester Basin during the late Palaeozoic – early Mesozoic. For more information on the Huntley Quarry Geology Reserve, contact Gloucestershire Geology Trust, or order a Reserve Guide.